​​​ MCKINNEY – Construction on a new $69.9 million stadium in the Dallas suburb is nearly complete, although the discovery of cracks on the home-side concourse has created questions about whether the stadium can be used this season. McKinney officials believe the cracks found in its stadium are cosmetic, not structural problems and repairs will be funded by contractors rather than taxpayers. The 55-acre site, near the intersection Sam Rayburn and ​Central Expressway, features a 12,000-seat stadium surrounded by parking lots, upper-deck seating on both sidelines, an attached events center, and a massive video board. 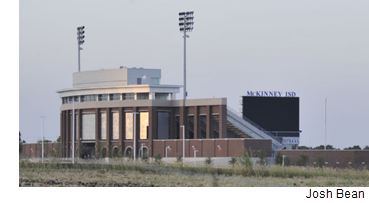 The stadium will be​ used by McKinney's three high schools—McKinney High, McKinney Boyd, and McKinney North. Construction is expected to be completed by August 2018.